Image © [caption id="" align="alignnone" width="566"] © Arian Zwegers[/caption] There is a popular legend in Syria that the Prophet Muhammad was heading towards Damascus, yet as he stood on a mountain facing the city he turned away, claiming that “man should only enter paradise once”. Over the last week the Free Syrian Army launched an offensive into Damascus itself. This is the first time since the 16-month uprising began that the opposition has penetrated Damascus. The offensive codenamed ‘Damascus Volcano’ began on July 15th, in what both the opposition and the regime now call ‘the decisive battle’. Clashes between government and rebel forces took place in Damascene suburbs and a vital road linking the capital to the airport. The most serious single incident occurred on July 18th when a suicide bomber targeted the National security headquarters. The attack killed many within President Bashar al-Assad’s inner circle including Defence Minister General Daoud Rajha, Deputy Defence Minister and Brother In-law to the President Assef Shawkat and two other ministers. The suicide bomber is said to have been a conference assistant, what this bombing demonstrates is that the FSA are able to infiltrate the security apparatus. Following the bombing, rumours swirled around Damascus that the President had been wounded and had fled the city. However, these rumours were put to rest when the Russian officials confirmed that President Al-Assad was still in Damascus. There are reports of more mass defections but the offensive into Damascus is the most significant piece of news this week. Damascus and Aleppo are considered to be the heartland of the regime. Without these two cities the regime will collapse. On top of this the rebels have captured a number of the border crossing into Syria from Turkey and Iraq. Along with Damascus there are now clashes and fighting taking place in Syria’s second city Aleppo. All of this has led the British intelligence community to conclude that Al-Assad’s regime will collapse within four weeks. However, the regime is fighting back and fighting hard. Damascus this week began to eerily resemble Sarajevo during the war. Rebels launched strikes in the central damascene district of Mezze, gunfights took place on Baghdad street near the Old City. Alongside another street called Baramka where a number of ministries and the university are located, was according to local reports under rebel control for an hour. The government has responded by shelling some of these areas inflicting mass casualties. Throughout Damascus people daren’t walk the streets; in the Palestinian refugee camp Yarmouk (southern Damascus) Syrians from other areas are said to have taken refuge. Their presence has led the Government to use militias to surround the camp. If anyone is spotted on the streets, a team of snipers will take them out. Damascus is the world’s oldest continually inhabited city, yet today it mirrors a ghost town. The road to hell might well be paved with good intentions, but the journey to paradise is littered with corpses. It is clear that Al-Assad will go but just how he will go remains to be seen. How will his tyrannous regime end? The possibility of exile is more complex than most people suppose in the case of Al-Assad. Where will he go? The smell of blood carries far. Which country can he go to and be immune from prosecution? Who would have him? He has become too toxic for the Arab states to offer him exile. It has also been suggested that his supporters and his family will not let him leave. If he leaves then the rest of his family as well as his supports are doomed. All this means is that the battle for Paradise will be a long, and bloody one. There is a popular legend in Syria that the Prophet Muhammad was heading towards Damascus, yet as he stood on a mountain facing the city he turned away, claiming that “man should only enter paradise once”. Over the last week the Free Syrian Army launched an offensive into Damascus itself. This is the first time since the 16-month uprising began that the opposition has penetrated Damascus. The offensive codenamed ‘Damascus Volcano’ began on July 15th, in what both the opposition and the regime now call ‘the decisive battle’. Clashes between government and rebel forces took place in Damascene suburbs and a vital road linking the capital to the airport. The most serious single incident occurred on July 18th when a suicide bomber targeted the National security headquarters. The attack killed many within President Bashar al-Assad’s inner circle including Defence Minister General Daoud Rajha, Deputy Defence Minister and Brother In-law to the President Assef Shawkat and two other ministers. The suicide bomber is said to have been a conference assistant, what this bombing demonstrates is that the FSA are able to infiltrate the security apparatus. Following the bombing, rumours swirled around Damascus that the President had been wounded and had fled the city. However, these rumours were put to rest when the Russian officials confirmed that President Al-Assad was still in Damascus. There are reports of more mass defections but the offensive into Damascus is the most significant piece of news this week. Damascus and Aleppo are considered to be the heartland of the regime. Without these two cities the regime will collapse. On top of this the rebels have captured a number of the border crossing into Syria from Turkey and Iraq. Along with Damascus there are now clashes and fighting taking place in Syria’s second city Aleppo. All of this has led the British intelligence community to conclude that Al-Assad’s regime will collapse within four weeks. However, the regime is fighting back and fighting hard. Damascus this week began to eerily resemble Sarajevo during the war. Rebels launched strikes in the central damascene district of Mezze, gunfights took place on Baghdad street near the Old City. Alongside another street called Baramka where a number of ministries and the university are located, was according to local reports under rebel control for an hour. The government has responded by shelling some of these areas inflicting mass casualties. Throughout Damascus people daren’t walk the streets; in the Palestinian refugee camp Yarmouk (southern Damascus) Syrians from other areas are said to have taken refuge. Their presence has led the Government to use militias to surround the camp. If anyone is spotted on the streets, a team of snipers will take them out. 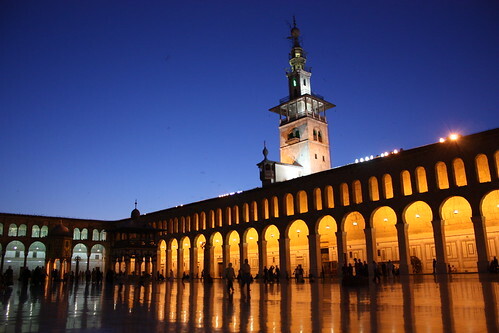 Damascus is the world’s oldest continually inhabited city, yet today it mirrors a ghost town. The road to hell might well be paved with good intentions, but the journey to paradise is littered with corpses. It is clear that Al-Assad will go but just how he will go remains to be seen. How will his tyrannous regime end? The possibility of exile is more complex than most people suppose in the case of Al-Assad. Where will he go? The smell of blood carries far. Which country can he go to and be immune from prosecution? Who would have him? He has become too toxic for the Arab states to offer him exile. It has also been suggested that his supporters and his family will not let him leave. If he leaves then the rest of his family as well as his supports are doomed. All this means is that the battle for Paradise will be a long, and bloody one.